She defies classification. She rocks, she rolls, she countries. She's a strong alto, but does lilting soprano. She evokes Patsy Cline (lyrically, yodelly), the Indigo Girls (gorgeous harmonies with her band), and Pink (in timbre). Yet Brandi Carlile is wholly unique as well. Sheryl Crow says this about her: "She has the most amazing voice I may have ever heard. Soulful. Country. Perfect in every way -- and propelled by taste." 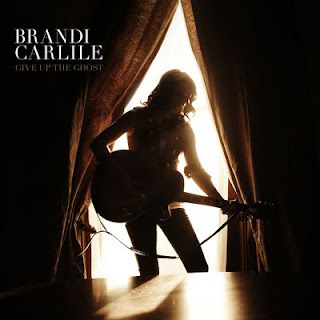 Listening to Brandi Carlile's new CD, Give Up the Ghost, is a delight. I adore every. single. song. Looking Out and Dying Day and Dreams, all with a foot-tappin' beat that gets into your head in a good way. And the delightful If There Was No You, a simple and lyrical song about a the bond shared by friends. And my favorite, That Year. Brandi explained during her recent concert that she wrote this song about a friend who committed suicide when they were teens. It brings me to tears, remembering some of my own losses. "You could have taken a long break instead of a long drop from a high place." And my other favorite, Oh, Dear, which kicked off her concert with only a mandolin as accompaniment. She had us at hello. Check out Brandi Carlile talking about her latest creation to the backdrop of her tunes, and then get your own Ghost. You'll thank me. fabulous write up and video. i too love the idea of 'timeless music'. she indeed has a timeless voice.